What does a Music Together Class Look Like? Summer Semester-June 7th to July 26th Flex Program-Only pay for 6 classes, 8 weeks of classes available to attend (Fri at 9:30am or 10:30am and Sat 9:30am) Perfect for a busy summer! *Each family will recieve a CD, songbook and a digital access code. 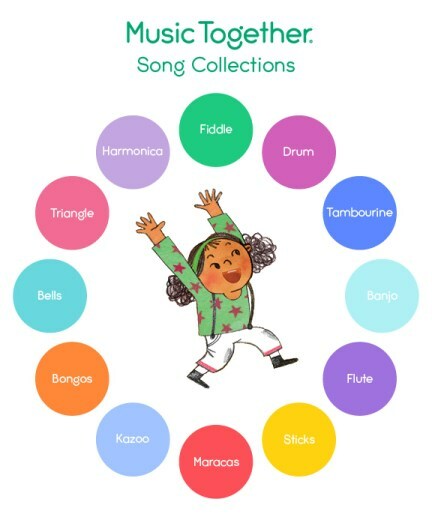 New families recieve the booklet Music and Your Child, a guide for parents and caregivers. Students will gain confidence by working on vital performance skills in a playful environment. We will learn about life long skills such as diction, characterization, voice inflection, and facial expressions. The week will include themed music, acting, snacks and crafts. Parents! Come to our performance on Friday’s at 3:45pm complete with costumes and props. June 3rd to 7th-Disney Karaoke-Enter a “Whole New World” with a Disney Karaoke class. Students will LOVE singing Disney songs into a real mic as a solo/group as well as creating choreography or movement. We will learn important singing and rhythm skills through a variety of Disney theme music and theatre games. June 17th to 21st-Pokemon-Use your imagination and create your very own Pokémon character that evolves. Students will love making their own Poke balls and put them to use while playing Pokémon Dodgeball. The week will include stage combat, a scavenger hunt, raids and making an iMovie with the group. July 8th to 12th How to Train a Dragon-Join us as we create our own dragon character complete with name, power and backstory. Students will make and take home their own dragon mask and will grow to dragon heights by walking on stilts. The climax of the week will include training for the “Dragon Olympics” which includes an obstacle course and prizes. $165 for a 45 min. personalized music class, enjoy the Art Park grounds, playground etc... and have the Music Together studio all to yourself. Invite as many friends as you would like, bring your own cake/snacks. Clean up is on us! $180 for off-site parties. I bring the music, egg shakers, sticks, fun and more to your location. Information about FREE DEMO CLASSES can be found by using the demo class scheduler. Copyright 2018 Wichita Music Together. All rights reserved.